Al Hartmann | The Salt Lake Tribune The new design of the corrected Utah state flag flies above the Capitol on Wednesday. 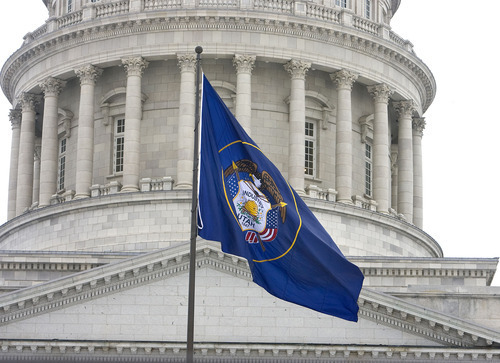 The Legislature passed HB490 designating each March 9 as Utah State Flag day. Every March 9 will now be Utah State Flag day with the passage of HB490 Wednesday. It was also exactly the 100th anniversary of when the Legislature adopted the first state flag. The state also for the first time flew on Wednesday a new version of the state flag outside the Capitol. "This establishes this day as the anniversary of our flag's adoption, just as [national] Flag Day [June 14] honors Congress' action in 1777 to adopt the Stars and Stripes," said Sen. Mark Madsen, R-Eagle Mountain, Senate sponsor of the bill. The Senate unanimously passed the bill and sent it to Gov. Gary Herbert for signature. Earlier this session, the Legislature passed a resolution to correct an 88-year-old mistake in the flag. That mistake put "1847," the year that Mormon pioneers arrived, beneath the flag's shield instead of within it as required by law. The earlier resolution also returned the flag to its original color scheme, which has a white shield instead of blue. Madsen told senators, "If you haven't had the chance to go out front of the Capitol on the south side and look at that massive flag that went up today at 9:30 today, it's quite a sight."